The towns close down during the entire festival and cars are banned turning the streets into massive pedestrianised zones. Throngs of people, up to a million visitors, fill the streets partying from dawn until the following dawn. 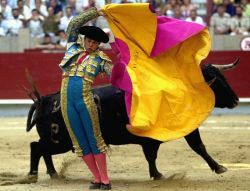 Love it or loathe it, bullfighting is enduringly popular in the south of France, particularly in the Languedoc, and is very much part of the culture here. It is a tradition for centuries, gleaned from the close proximity to Spain. If you really can’t bear the spectacle of the bull fights, or corridas as they are called here, you don’t have to go. You can still glean all of the excitement, admire the culture and soak up the atmosphere on the roads of Beziers after the arena empties. There is so much to do and see you will find that you want to be in two places at once. There is the enchanting horse show, the Spanish flamenco dancers, concerts, processions of floats and bands and much, much more. The Feria offers many different types of entertainment which suit all ages. There is always something going on, and most of it is free. You can buy drinks and food along the entire length of the streets from the bodegas along with loud music and crowds enjoying themselves.